AK - 47 Assault Bow. Card Artwork. Item Type: Archery Combat: Evolved. The AK-47 Assault Bow is a new innovation in medieval ranged combat. Its high rate of fire and ease of parts assembly makes it an ideal weapon to storm many a castle. Created by the Bear Calvary of TransSiberia, the Assault Longbow replaces weapons such as the arm-straining Longbow, or the equally powerfully, but slow reloading crossbow. However, due to its ease of parts assembly ,the Ak-47 Bow has been often duplicated and many variants exist within other kingdoms and has become standard issue for fringe groups such as goblins, orcs, and thieves. So should you find yourself against such enemies and succeed in felling them, be sure to pick up this weapon, for it is indeed, a dependable item to have. 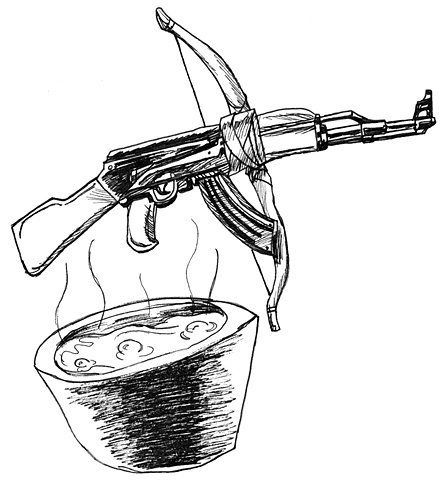 The design of this was simply to draw an AK-47 with a bow attachment. I gave it a forging kiln under it to give the impression that this weapon was made in the forges, when actually, it was simply duct-taping a longbow to an assault rifle. Also, the brief history of the weapon has some basis in facts, but lord knows which are true and not. I sincerely believe there is a Bear Calvary in Transiberia though.